When the first oral history interviews with Holocaust survivors appeared, they tended to focus only on wartime experiences. Archivist Barbara Kaiser of the Wisconsin Historical Society thought this approach was flawed, since it artificially isolated the horrors of the Holocaust from the rest of the narrator's life. So Kaiser designed a series of interviews with Wisconsin survivors that discussed not only the Holocaust but also their family history, their childhoods, their post-war lives, their experiences as immigrants, and their opinions of America. In 1979 and 1980, she arranged 22 of these interviews, including this one with Magda Herzberger. 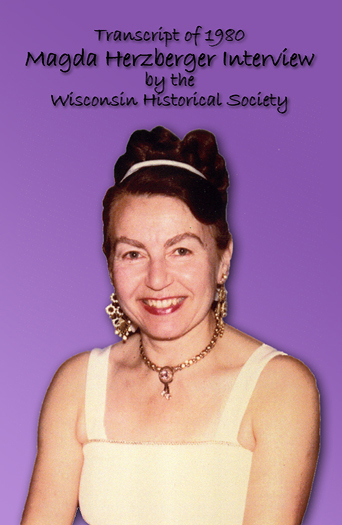 All the Wisconsin interviews are online in their entirety at wisconsinhistory.org. they endured more than a year in an internment camp on Cyprus. She provides eyewitness account of the birth of Israel and of starting a new life in the United States in 1957. She shares her feelings about her adopted country, about parenting and family life, about being Jewish in a small town in the Midwest, and about deciding to speak and write publicly about the Holocaust.